The Buddh International Circuit will once again open its doors for all speed demons, only this time it is not for the Vettels or the Sutils. For anyone who would like to experience sheer driving nirvana, the Jaypee Sports International Limited (LPSI) has organized loads of high on adrenaline activities. So mark your calenders for the BIC time trial season 2, where you will have an opportunity to experience driving and riding the world class Formula 1 circuit. 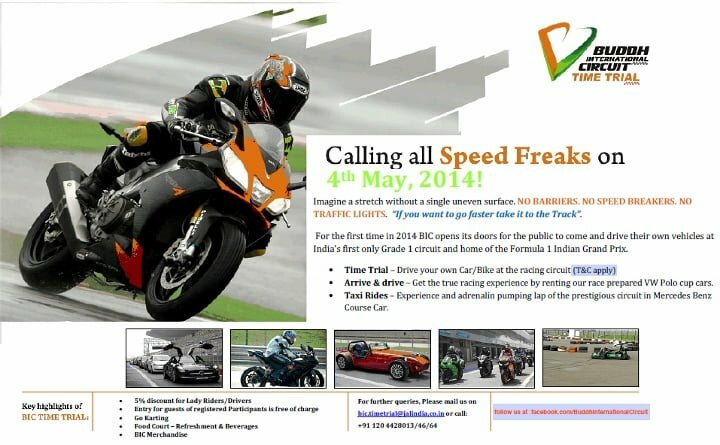 The BIC Open Track Day will be held on the 4th of May 2014. Participants can bring their own cars or bikes and register for any number of sessions with each lasting 45 minutes. They will also be required to wear a proper riding gear like the one-piece leather jacket, gloves and helmet before hitting the track. It is recommended to bring your own gears but BIC might make arrangements for renting facility which we cannot confirm as of now. Depending upon the type of machines, participants can hit the track either in the Regular slot or under the Superslot which of course will be for the super bikes and cars. Registration fees for the participants under the regular slot will be INR 5,000 for cars and INR 4,000 for bikes, per session. Superslot registration will cost car drivers INR 5,500 for cars and INR 4,500 for the bikers, per session. BIC this time has made sure that even those who doesn’t own a car or doesn’t know driving can taste the thrill and buzz which is inherent with this world class facility. Participants can rent Volswagen Polo Cup cars for a 20 or 45 minute session which will cost them INR 12,000 and INR 17,000 respectively. 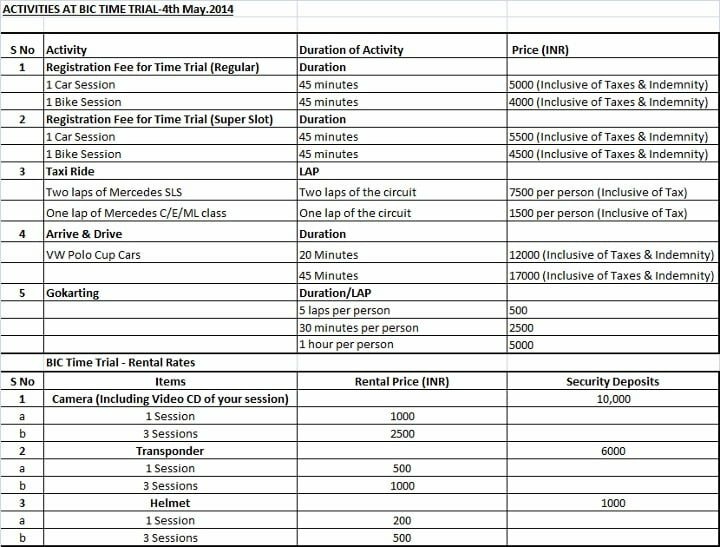 People keen on taking a Taxi Ride of the circuit can do so by choosing between Mercedes SLS for 2 laps at INR 7,500 and Mercedes C/E/ML class for 1 lap at INR 1,500 per person. A Gokarting facility at the support paddock area has also been included in the list of activities that one can opt for. An individual can try his hands on the Gokarts by paying INR 500 for 5 laps, INR 2,500 for 30 minutes and INR 5,000 for a 1 hour session. Cameras, transponders and helmets can be rented at the BIC circuit with a nominal security deposit. Bikers especially, need not carry food and beverages since a food court will be available for enjoying the same. Female riders or drivers can grab this opportunity to participate in the events at 5% discounted fees. A one-piece leather jacket is a must for bikers. Full face and quality tested helmets are preferable. Remember that the events are time trials i.e. bettering your own lap timing and not racing among the fellow participants. So focus on ‘your’ time on the track instead of bothering about who overtook you. Entry for the guests of the registered participants will be free of charge. BIC merchandise will also be available for those keen on shopping. If the present day weather is to be trusted upon, the conditions on 4th May will be dry and hot. So riding on road tyres at road pressures will tend to overheat, leading them to loose some grip. Dropping 10 PSI from both the tires is recommended. Qualified BIC instructors will perform a safety briefing to explain the safety rules and protocols. They are likely to scrutinize every vehicle for its track worthiness to avoid any problems. So buckle and tune in your engines to unleash hell and beat the clock. Will you be going to the event? Let us know in the comments section below.